Next up is a random shot of the RustyButTrusty Alfetta GT, just before the long drive up to its new Pacific Northwest home to join RustyButTrusty’s new HQ. For some reason, in the middle of California’s worst drought, one of the few nights it spends outside involved rain. Perhaps it was California’s weather gods reminding the Alfetta of what it was in for in its new home. This surprise find is a former garage-mate, a 1959 Sprint Veloce that shared shop space with the Alfetta GT and Lancia Beta a few years back. Easily recognized by its black, home-made hood and rough-and-ready appearance, it sports a hot-rod 1400cc engine that was rebuilt by a Ferrari mechanic. It was said to be a pretty fast car, and when it joined the shared shop, the then-seller had offered it at $13,000, paired with a project spider of the same age… and it lingered on the market for quite a while because it was in a remote part of California! How times have changed. 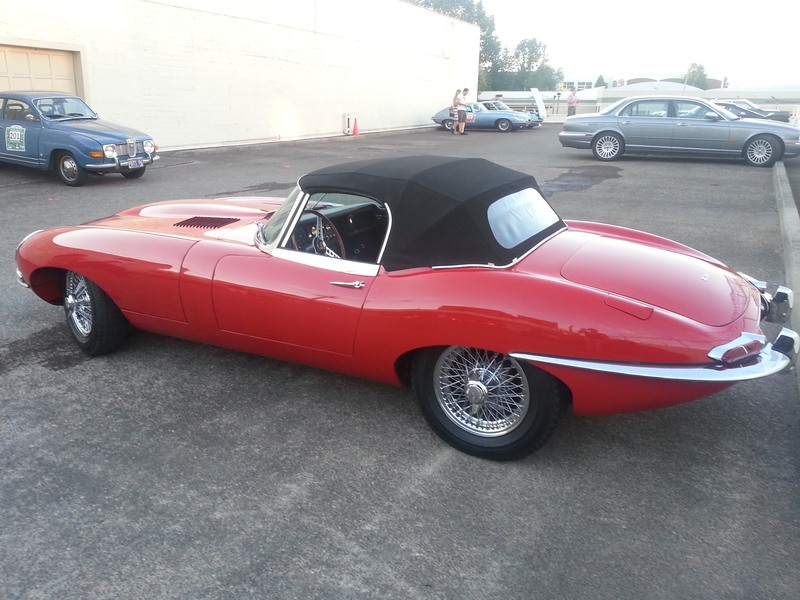 This red Jaguar E-Type was at the send-off for the Monte Shelton rally in Portland. 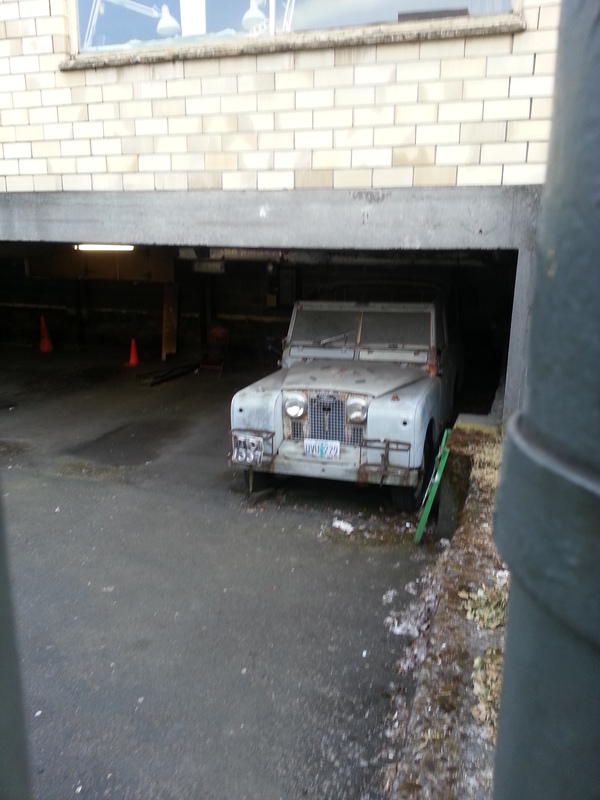 Sadly, this is another one-time dream car that has slipped out of reach – even the 2+2 cars are slipping away. The red ones have special meaning since your writer’s father picked one up from the factory in 1965. 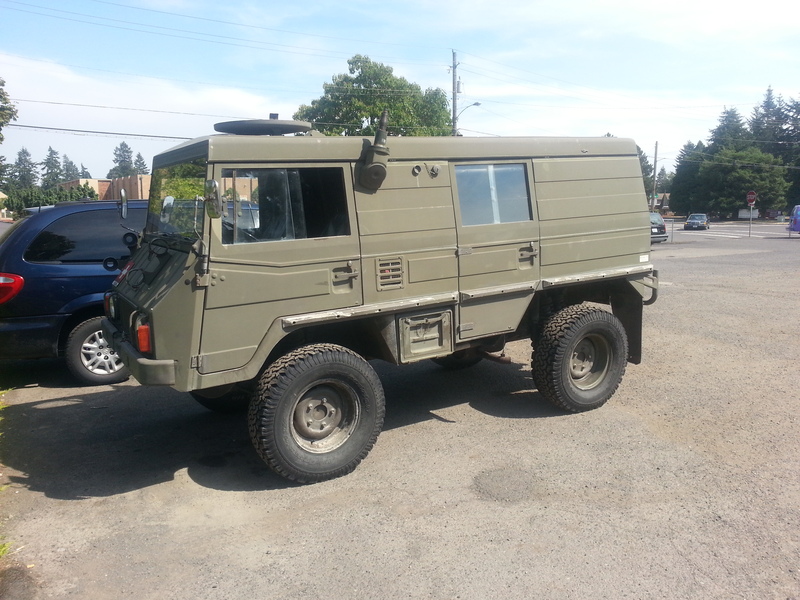 Here’s a Pinzgauer, spotted in lovely Vancouver, WA. This one looks like it’s primarily used on the road based on its tires, it can probably still go much further than most other vehicles. And with that satellite dish on the roof, this former military ambulance is probably set up for camping/fishing duty. 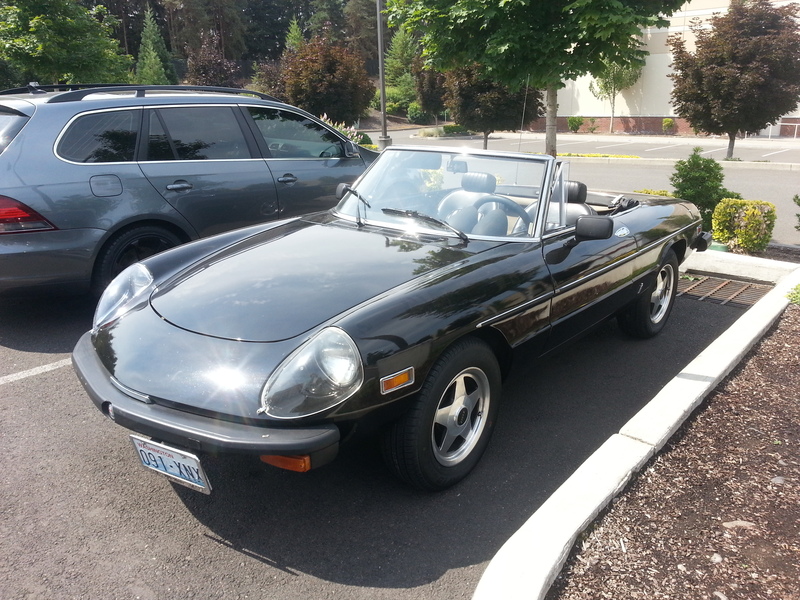 There’s nothing as sad as being without an old car in the garage (ok, maybe there is, but not in our context) and spotting this Alfa Romeo Spider Veloce helped the blues a little. With its bigger mirrors and carpeted interior, this looks to be a 1978-81 model. The headlight covers do a good job smoothing out the design, though keeping them clean is a fiddle, and those practical bumpers don’t really help the design. 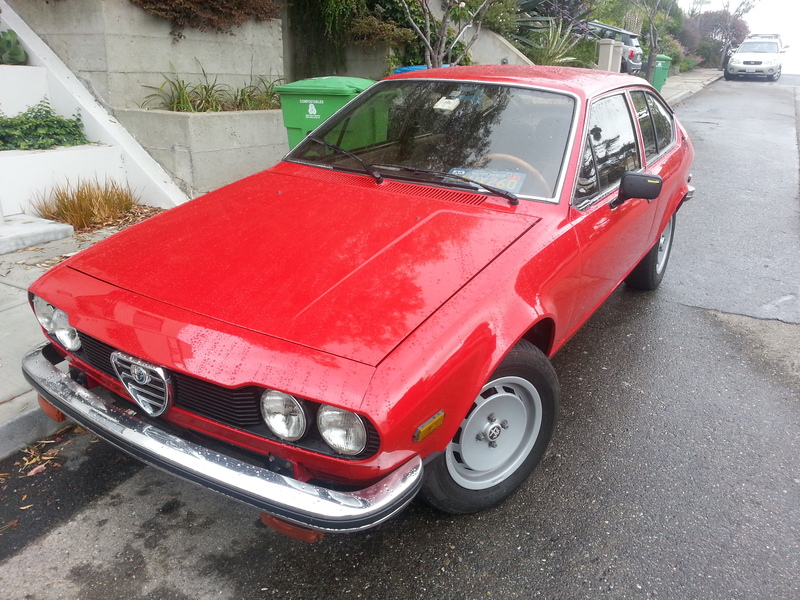 This Alfa Romeo GTV6 is visible from a local freeway, and seems to be in decent cosmetic shape, but spends long periods sitting – probably not the best thing for the car’s long-run mechanical survival, so perhaps the seller is procrastinating on a timing belt change or similar. 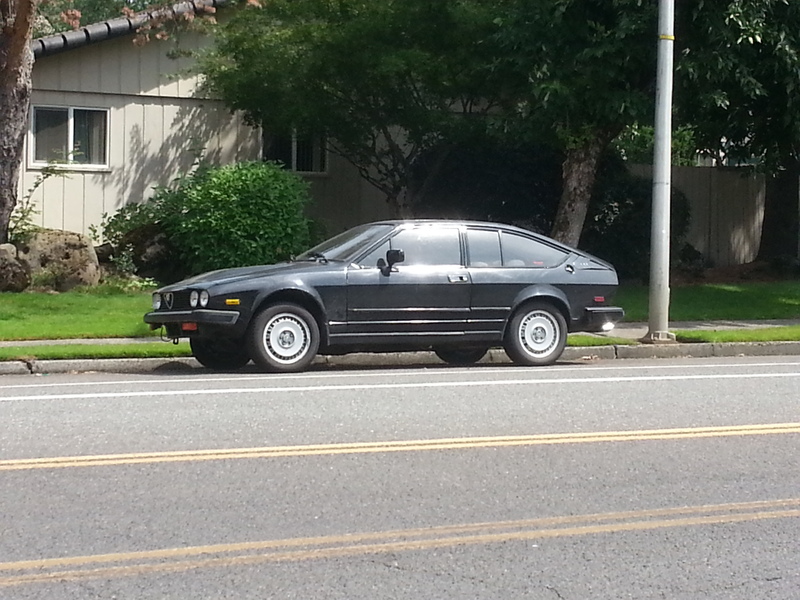 Odds are good this is the only GTV6 in all of Vancouver, WA. 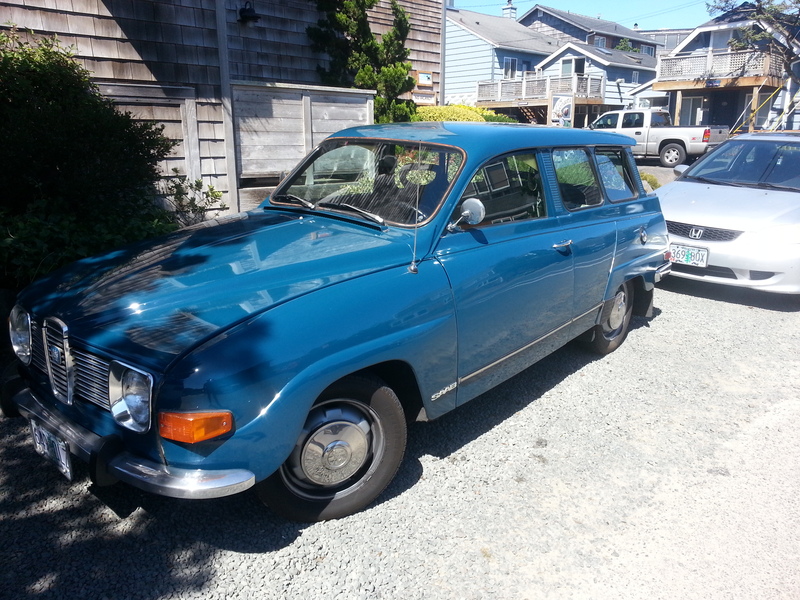 Look at this gorgeous Saab 95 wagon, spotted in Cannon Beach, OR. This blue is an unusual color for these that works really well. Do you know a smaller wagon that seats seven? Just as importantly, does the average Swedish family have five kids and no luggage? 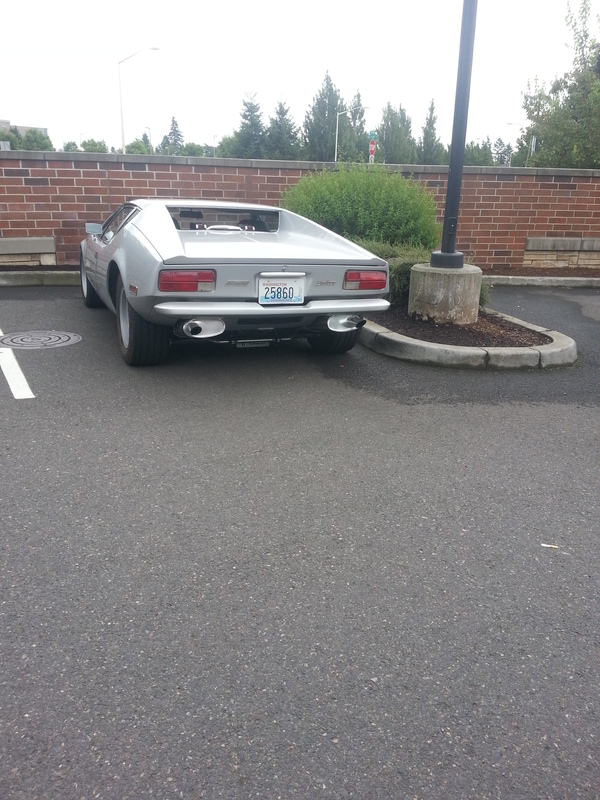 Here’s a clean DeTomaso Pantera in a restrained color combination. This is probably not the pre-L car, judging by the one-piece bumper, and the tail pipes suggest there’s more modification underneath than outside. 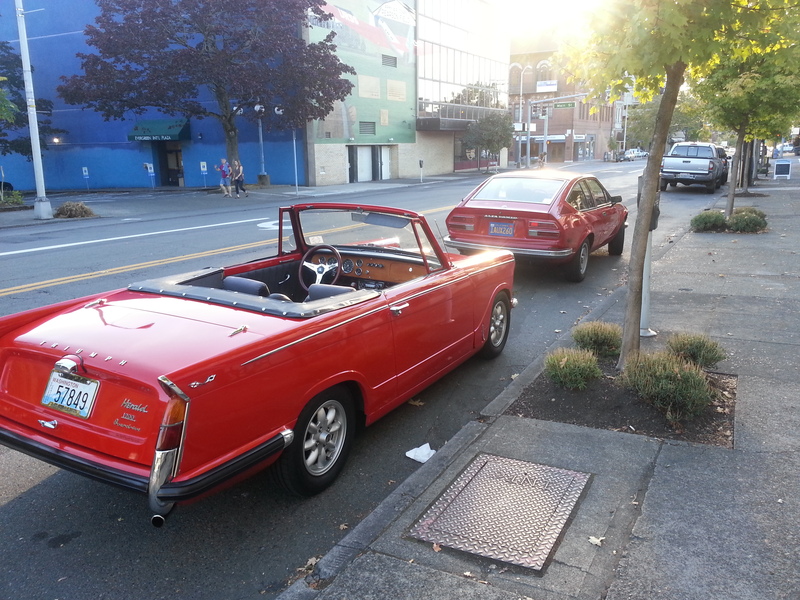 Is that a Triumph Herald and an Alfa Romeo Alfetta GT parked together? When’s the last time you saw something like that on the street? Never? Well, you’re welcome. This Herald is a gorgeous example, very clean looking and tastefully lowered over Panasport wheels. It’s nice to see it in this shape, as most of them are either ratty projects or preserved originals. What oddballs have you seen in your neighborhood? 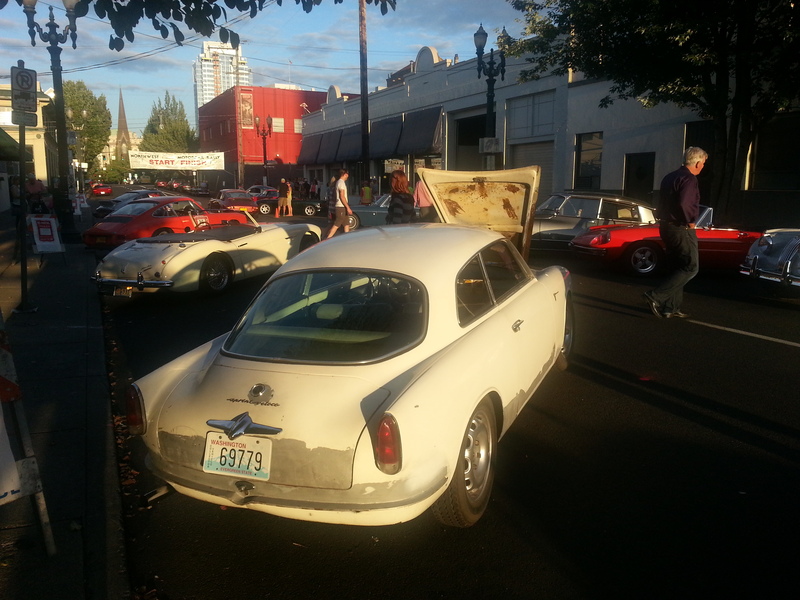 This entry was posted on October 18, 2015 at 2:05 pm and is filed under RustyButTrusty on the Street. You can follow any responses to this entry through the RSS 2.0 feed. You can leave a response, or trackback from your own site. saw a Studebaker Hawk of some sort zoom by the shop today. Wow, looks like the concept of regularly driving old cars is alive and well in BC! Honestly, many of the more interesting ones were seen in Bellingham, WA. That town has a high interesting car ratio. That’s interesting… I have family near there, will have to actually venture into Bellingham and see what I see.